Based Standard DIN 3851 Hy-Lok Corp. DIN fittings have been improved to comply with current standard requirements. They conform to installation standard DIN 2353 and all of their constituent parts are interchangeable with competitor products provided they comply to the basic standard requirements as applicable. Our production facilities have many years of experience in the manufacture of precision products which in conjunction with stringent quality control from the starting material up to the finished component determines the quality of Hy-Lok Corp, fittings. Hy-Lok Corp. Fittings are machined from drawn steel bar or steel forgings. Materials according to DIN 3859 (technical pecifications for tube fittings). Nuts are either cold or hot pressed. Fittings made of stainless steel. X6CrNiMoTi17122 to DIN 1 7440, material No. 1.4571, is also available for supply. Caution! 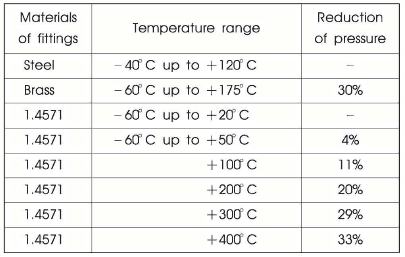 The use of steel is permissible up to 120°C max. For any temperature higher than 120°C, use material 1.4577. The pressure specifications, given in our catalogue relate to steel fittings with a static load at a temperature up to 120° C and refer to Nominal pressure(PN) acc. to DIN 2401. The rated pressure has a safety factor of 4(DIN 3859) Permissible working pressure (PB) of the operating pressure acc. to DIN 2401. The security factor for PB is 2,5 of 1,5 respectively. Caution! 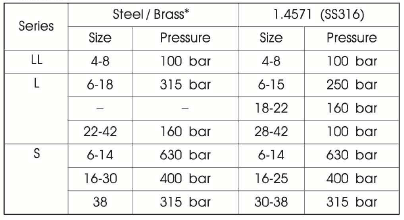 For certain types of fittings the nominal pressure differ from those shown above, in which case the ratings indicated for the individual types should be observed! Please refer to the information given in the section "Reduction of Pressure"
Caution! If different fitting and sealing material are used, the lowest temperature as indicated for each material is applicable! The following reduction of pressure compared with the catalogue specification for higher temperatures. For different material of tubes and fittings. The tubes must be tested separately concerning the allowed temperature range and the necessary reduction of pressure. All ranges fittings are galvanized and yellow passivated. All weldable fittings are phosphated. Nikel-plated on request for carbon steel. Hy-Lok Corp. DIN fittings are designed for the use of commercial hydraulic oils. If special fluids please contact our application engineers.